If used as temporary tape or transfer tape, only apply minimum pressure. The polyimide (Kapton) tapes exhibit low outgassing properties and are ideal tapes for high vacuum aplications. Excellent performance for electrical and thermal insulation with high dielectric strength. Although the use temperature range is specified as -75 to +260°C, polyimide (Kapton) tapes has been successfully used in the temperature range of -196 to +400°C. electrical insulation on transformers, coil and electro motors. The standard polyimide (Kapton ) tape has a thickness of 0.06 mm. For application where higher strength is required the polyimde tape is offered in 0.08 mm and 0.12 mm thickness. Available in widths from 3 to 50mm with a length of 33m. Clean 76mm diameter plastic core. 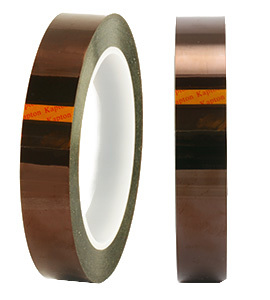 The double sided polyimide tape consists of a polyimide film with silicon adhesive on both sides. The tape is wound between two polyester liners. The two liners make clean handling of the tape easy: cut to required length, unwind the tape from the first liner and leave on the second liner. Apply tape and remove second liner. Tape material and adhesive is the same as for the single sided polyimide (Kapton) tapes. Available in widths of 5 to 50mm with a tape length of 20m. Clean 76mm diameter plastic core. The low static single sided Polyimide (Kapton) has been designed for use in ESD sensitive applications. Unwinding conventional Polyimide tapes can generate static electricity. 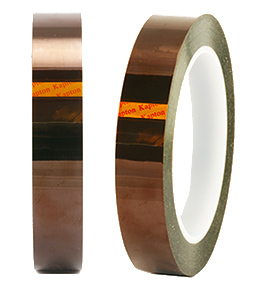 The self wound low static polyimide (Kapton) tape comprises similar specifications as the single sided Polyimide tape combined with extremely low electrostatic discharge properties. The tape has been threated to greatly reduce electrostatic discharge. Available in widths of 5 to 50mm with a tape length of 33m. Clean 76mm diameter plastic core.